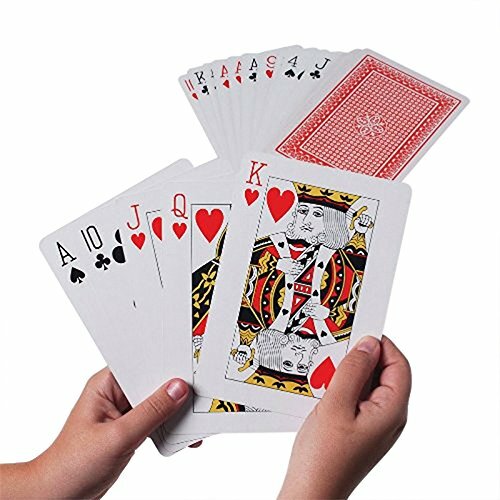 Bring more fun to your usual card game！ Jumbo Playing Cards are a fun alternative to traditional playing cards. Each card is 8-1/4" x 11-3/4" inchs.Perfect For Anyone To Enjoy! Full standard deck includes 52 standard playing cards and 2 jokers. Go Fish, Poker, Crazy Eights, and more. They can also be used to build a GIANT house of cards or decorate children's party. Deck includes 52 standard print huge playing cards and 2 jokers as well as a box to store them in when not in use. Each card is printed on heavy-duty card stock coated on both sides to ensure an authentic feel at an outrageous size. From classics like Texas Hold 'em and poker to the more family friendly Go Fish. 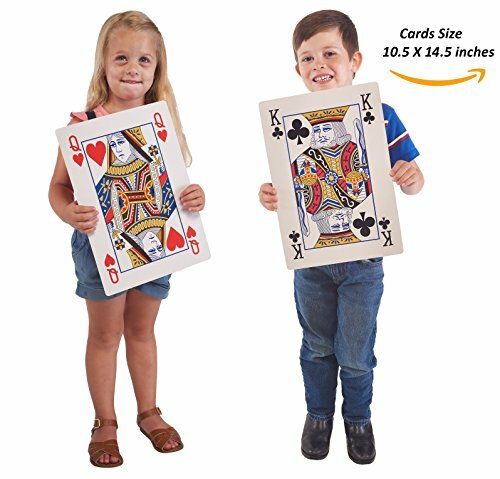 Both children and adults will love these humongous playing cards. 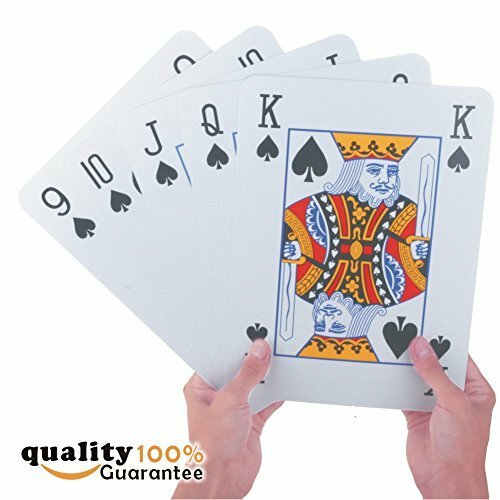 These JUMBO playing cards are a must for your next family night, poker game, or social event! 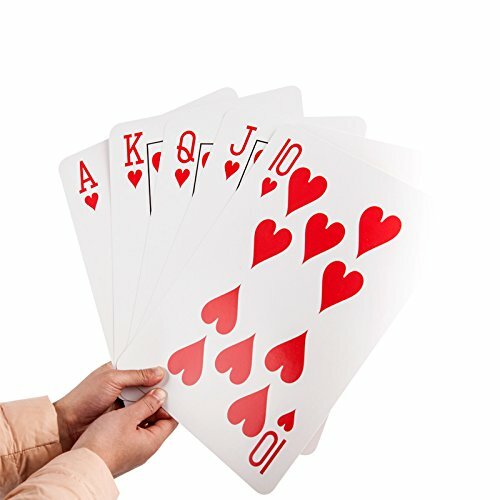 Whether used to actually play card games or to decorate for a party, these unique Giant playing cards will be a hit! 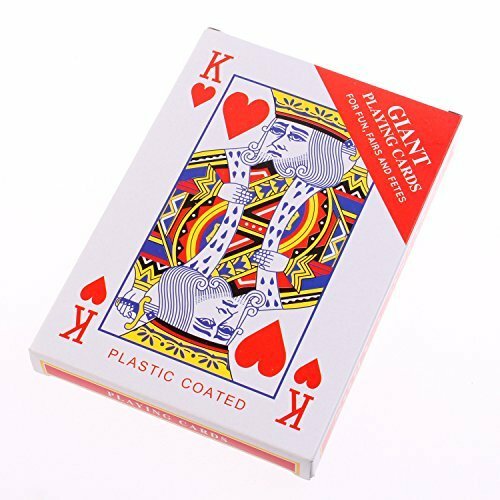 The playing cards plastic type coating make them cards for kids as well as cards for teens and for seniors, in fact, fun for all ages!! 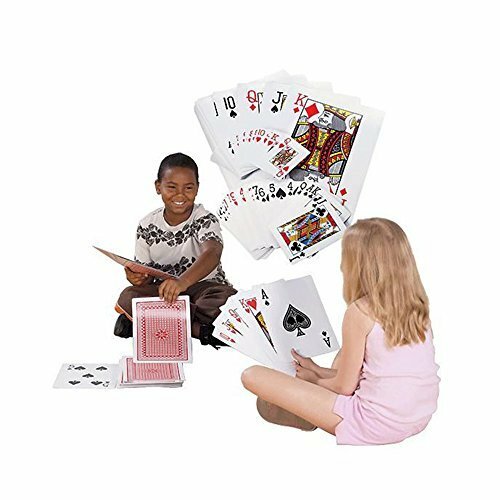 Set comes in a playing card box and includes 52 cards plus jokers with standard print and can be used on a playing card table, on the floor, or even as a math aid in the classroom. Give them as novelty gifts or party favors! 8 times larger than a deck of standard playing cards- They're humungous! Each 8-1/4" x 11-3/4" card is printed on heavy-duty card stock coated on both sides. Deck includes 52 standard poker cards and 2 jokers. Make any card game more fun! 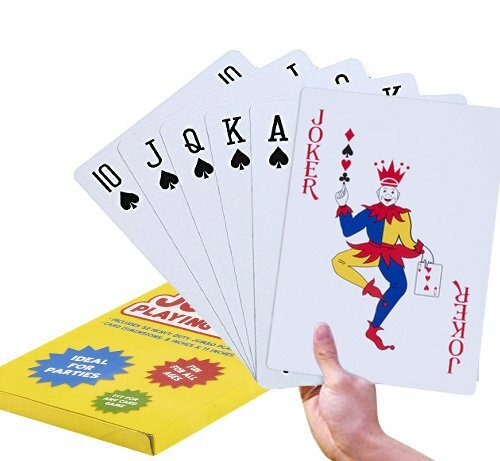 Giant Jumbo Deck of Big Playing Cards Fun Full Poker Game Set - Measures 5" x 7"
Giant Playing Cards are a fun alternative to traditional playing cards. Card sizes are 5 in by 7 in and come 54 per deck. These playing cards are perfect for playing practically any deck cards game you can imagine. They could also be used to build a giant house of cards. Children and adults will love the extra fun the jumbo size will bring to your games!PMLAND Brand Philosophy PMLAND values our customers by keeping YOUR shopping concerns in mind, therefore, we deliver products with our best: CREATIVITY for your convenient use and fun experience QUALITY by using durable materials, delivering best-in-industry design and monitoring on manufacturing/packaging control SUSTAINABILITY by supplying environment-sustainable, family-friendly, safe and healthy choices. We take great pride in the products we supply, that's why we offer a 100% Satisfaction Guarantee. NOTICE: PMLAND is a registered trademark with the USPTO in USA. Make sure you are only purchasing from PMLAND to avoid any product quality problems. These playing cards are perfect for playing practically any deck cards game you can imagine. They could also be used to build a giant house of cards. Children and adults will love the extra fun the giant size will bring to your games!PMLAND Brand Philosophy PMLAND values our customers by keeping YOUR shopping concerns in mind, therefore, we deliver products with our best: CREATIVITY for your convenient use and fun experience QUALITY by using durable materials, delivering best-in-industry design and monitoring on manufacturing/packaging control SUSTAINABILITY by supplying environment-sustainable, family-friendly, safe and healthy choices. We take great pride in the products we supply, that's why we offer a 100% Satisfaction Guarantee. NOTICE: PMLAND is a registered trademark with the USPTO in USA. Make sure you are only purchasing from PMLAND to avoid any product quality problems. 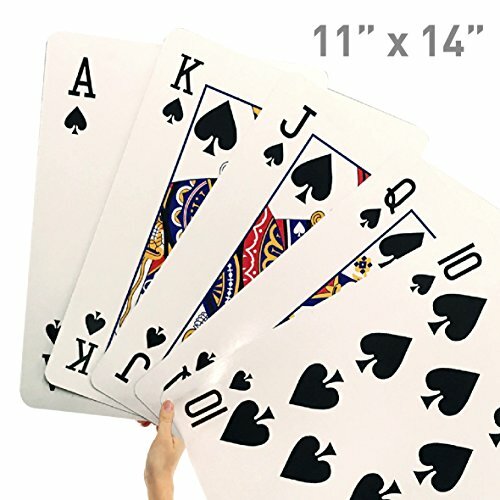 Giant Jumbo Deck of Big Playing Cards Fun Full Poker Game Set - Measures 8-1/4" x 11-3/4"
Compare prices on Huge Playing Cards at ShoppinGent.com – use promo codes and coupons for best offers and deals. Start smart buying with ShoppinGent.com right now and choose your golden price on every purchase.